When you look up at the sky to witness the transit of Mercury, make sure you use approved, specially-designed filters in your equipment, warns the Royal Astronomical Society, or you could risk permanent damage to the retina and even blindness. Never look straight up at the Sun with the naked eye. The transit of Mercury occurs when the smallest planet in our solar system – Mercury – passes directly between the Earth and the Sun. It is not like those eclipses when daytime can turn to nightime. Mercury is a very small planet and appears just as a tiny dot in front of a giant Sun. If you live travelling distance from central London, you should consider taking up the RAS’ invitation to the general public to come and enjoy the transit of Mercury in its premises using specially set-up equipment. 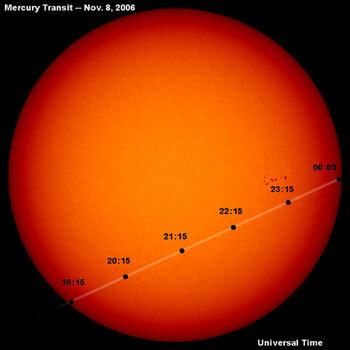 Transits are not frequent events, says the RAS, the last time an event like the next transit of Mercury on 9th May occurred was in 2006 – the last such event in the UK occurred in 2003. After Mercury’s transit this month, the next ones will take place in 2019 and 2032. The RAS says everyone across the UK should be able to have a good view of the transit next week, as long as we have clear skies. The whole event will run from 12:12 BST tto 19:42 BST. Sky-gazers will be able to see a silhouetted disk (Mercury) moving slowly against the bright solar surface. To allow members of the public to witness the transit of Mercury in safety, the RAS has organised a special event in the courtyard of Burlington House, Piccadilly, central London. Professional astronomers will be on hand to help operate the telescopes, which have been fitted with safe solar filters. If you are within travelling distance of central London on 9th May, the RAS urges you to come, where its staff will be on hand from midday until at least 4pm, and probably until the Sun sets over neighbouring buildings. The telescopes and other equipment will be mounted outside the Royal Academy. The RAS will also be hosting a live feed of the transit of Mercury in its lecture theatre. Its library will hold a special mini-exhibition of Mercury materials. “Both of these rooms are located in our building on the opposite side of the courtyard to the telescopes,” says the RAS. The transit of Mercury will be observable across the whole of Western Europe, South America, the eastern part of North America, West Africa, and the western region of North Africa. Every century there are from thirteen to fourteen transits of Mercury, which makes them relatively infrequent events. However, most of them are viewable from many parts of the world. Pierre Gassendi (1592-1655), the French philosopher, priest, scientist, astronomer, and mathematician, was the first human to observe a transit (1631). This occurred two decades after the telescope had been invented. The Romans were strong believers in gods and goddesses – they were convinced that they were in charge of everything on Earth. They named Mercury after the messenger for their gods. The Roman Mercury had a helmet and shoes with wings on them. He could travel very rapidly from place to place. The planet Mercury moves very fast around the Sun. According to NASA, that is how it got its name. This European Space Agency video contains a simulation of the transit of Mercury, 9th May, 2016 in CET (Central European Time).